The only thing is with making your own cakes for your childrens' birthdays is that there is a certain pressure for the cake to be better and better with each year and each party. So the pressure was on to go one better with Harvey's second birthday cake after the success of his first birthday cake. 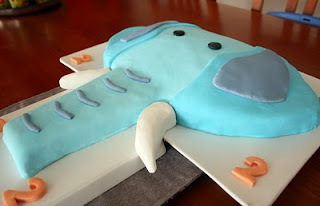 I wanted to go with a theme cake that would appeal to him as well as be realitively easy to make. He loves his elephant toys and my elephant paintings and repeatedly demands renditions of 'Heidi Ho' so Elephant it was! 1. Bake cake - I have found a very basic butter cake to be economical and easy to cut to size once cooked. 4. Add food coloring of choice. If you want bright colors you need to either order colored fondant, or get the quality coloring (use too much of the supermarket stuff and your icing goes sticky) so pastels it is! 6. If you are joining cakes together it is best to cut the tops off and cut them to size for a good match up. Use a quality bread knife for cutting and don't go too fast so you don't get too much crumbling. **I drew my design in advance and placed it over the cake, then cut around it. I still have the template somewhere and will share it here once I find it. 7. Using butter icing (frosting) spread over your cake to fill in any gaps, joins or crumbly bits, let this set. 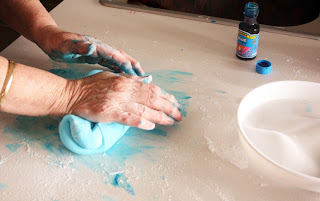 (I have previously used a jelly spread or sugar paste under the fondant so that it sticks, but didn't this time and it was ok.
8.Roll your fondant out with a roller (using the sifted confection sugar) on Baking Paper (or greaseproof paper). Once it is even and to thickness you can pick up the paper and turn it over onto the cake. Once positioned on the cake you peel the paper off and you have a smooth, shiny surface with no white spots or dry bits. This is the best tip I have! 10. Take a photo of your cake now! Don't wait until the party or you will forget or run out of time or something equally frustrating. It is important to have a record of your hardwork and creativity! Harvey absolutely loved it 'Phant, Phant!' he shouted delightedly when he saw it (his word for 'elephant' of course) then waved his arm in the air and gave a two year old trumpet 'Bruauauurrrr'. He even blew his candle out all by himself. It made it all worth it. I'm following you back. Nice to 'meet' you! I'm following you back--thanks for stopping by! That is too cute! You are very talented! Yes you do most certainly have a great talent. And 2 babies too. Wow! I am visiting and following via boost my blog. I hope you enjoy a peaceful weekend. it is too cute! You are very talented! Thanks for the complements. Not so sure on the talented part, but I am getting better with every cake. There is a lot to be said for trial and error. Can you post the template for the elephant? 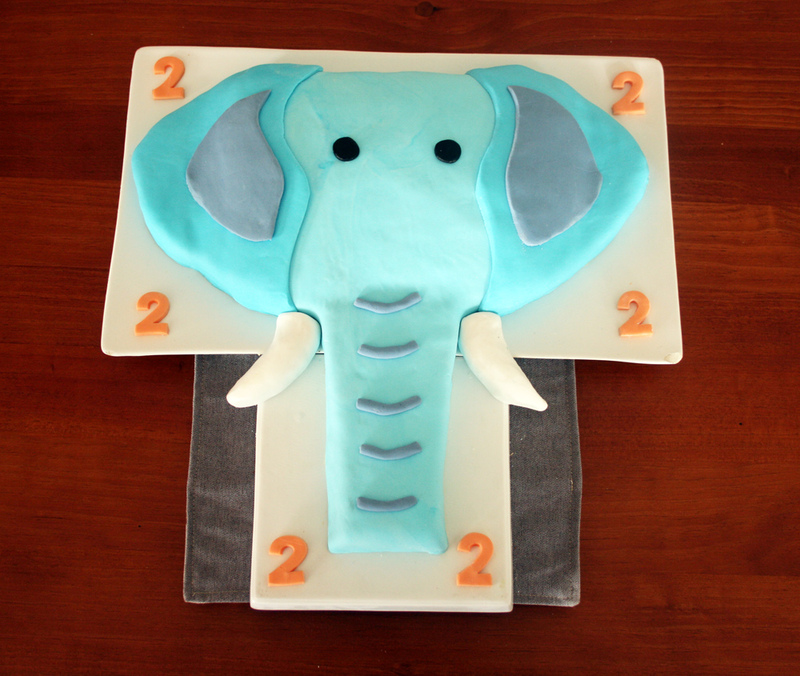 I'd like to make it for my son's 2nd birthday as well in a couple of weeks. So CUTE! Are the ears a bit darker blue? 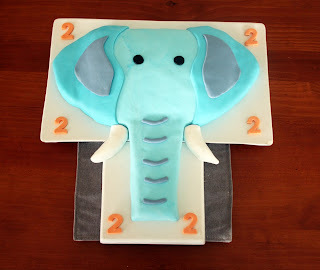 What did you use for the eyes and the #2 around the cake? What about the 'cake plate(s)'? P.S. I have 3 boys now (the 3rd is turing 2) My middle one is Felix as well! The ears are a bit darker, I just added more coloring to the fondant. The #2s are also made of fondant - rolled out like cookie dough and then I used number cookie cutters I already had to cut them out. The eyes are also fondant shaped to size, allowed to dry and then I painted them with black paint. I don't know if I recommend this as I had to make sure they were totally dry before I placed them on the cake, and I made sure to remove them before any cutting or eating commenced (I am sure you could use any buttons or chocolate milk buttons for a similar effect). One more tip - place the face and trunk fondant first and let it go over the ears a bit (tapering down so you don't get a line) and then place the ear cut out fondant over the top. I am going to try to find the template and post it asap. I forgot to say that I used two plates and joined them together and actually sat them on top of a drying rack that I put a nice placemat over. You could either make your cake a bit smaller to fit on one plate or do the same if you have two plates that will work together. Hi! Do you have the template available yet? 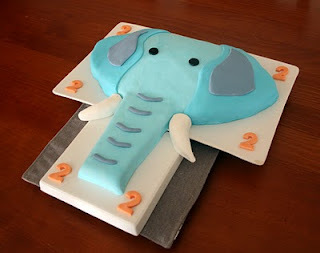 I want to make this cake this weekend. Also, what size cake did you bake? Did you just make a double-layer 9x13 and use the cut off pieces to piece together the trunk? Another tip for fondant: Use a handheld steamer to make your fondant shiny and smooth when you are all finished. Just go lightly over the cake. Hi. I have made another template up but am having trouble uploading it to the site at the moment (I will upload it asap but can't guarantee it will be before the weekend). I know you want it before the weekend..can I email it to you? Most of the best handheld cleaner’s upholstery heats water within 45 seconds to 2 minutes. So, it all depends on you. The temperature and power of steamer are also essential facts. The dust mites die when the temperature is about 130-degree Fahrenheit. These excellent steam cleaners can produce more temperature of steam like 200+ degree Fahrenheit. Playroom decor - as easy as ABC!